Center for Economic Research and Forecasting | Will Rates Rise? The FED has announced the end of its Treasury issue purchase program. Market commentators are speculating that bond rates will rise, potentially delaying or stifling economic recovery. While it will be true that the FED-demand-factor will go away there are other factors that influence interest rates. Another important factor that influences all interest rates, not just Treasury issue yields, is expected inflation. The idea that supports the market commentary would be an increase in expected inflation, an increase that would be brought on by economic growth. This growth would provide a signal to investors that they could re-allocate their portfolios away from bonds into relatively riskier assets like stocks. This would be parallel with a re-pricing of bonds at a lower level. The low risk and relatively low real rate of return on bonds would no longer be desired. However, we do not expect inflation to rise much. 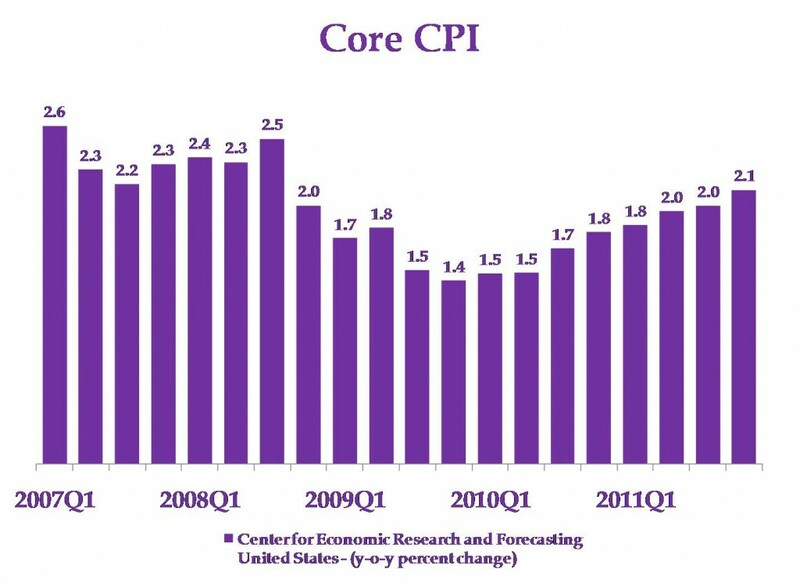 A chart of our forecast of the core CPI is included below. The core CPI excludes food and energy, items that add considerable volatility to the CPI. We do expect the core CPI inflation rate to rise but at a very slow pace. We forecast a slight pickup in inflation growth in 2010 quarter 3, the quarter after we forecast a return to positive GDP growth. However, the growth in GDP and inflation will not be enough to spark a big re-pricing of bonds in the United States. This realization that inflation will remain low may play out in largest part during February through July. This will be after the first estimate of United States 2009 fourth quarter GDP growth, and before the first estimate of United States 2010 second quarter GDP growth. 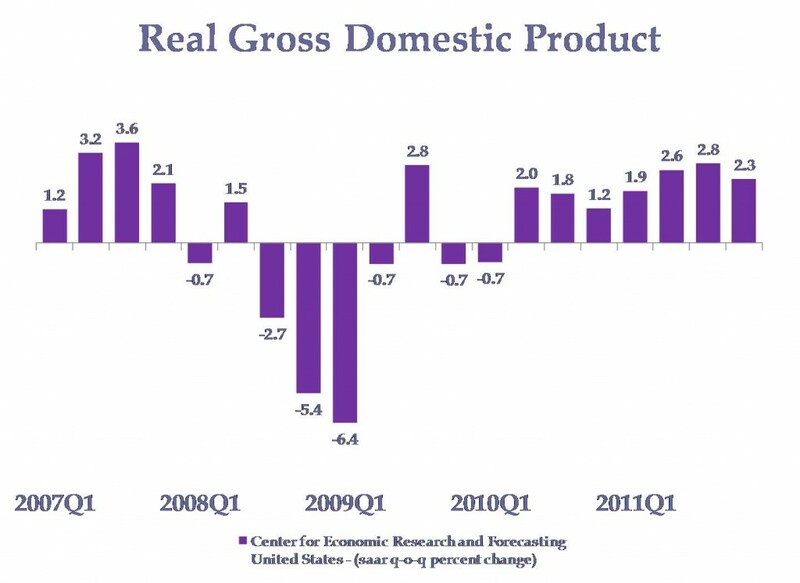 We expect that the first estimate of 2009 fourth quarter GDP growth, which will be published January 29, 2010, will disappoint the market. We may see a bond-market rally, but not a major sea-change, perhaps something to the tune of 50-100 basis points. The first estimate of 2010 second quarter GDP growth, to be published July 30, 2010, will hopefully provide a positive surprise to the market. There might be some sell-off of bonds at that time, but again, we would not expect that reallocation to be a major one either. During January, there might be a Treasury yield increase driven by current expectations of rising inflation and reduced FED purchases. Agency bond yields would remain pretty tight to long Treasuries. Corporates in this scenario would likely remain flat until experiencing a small rally similar to Treasuries in February. California November Jobs: Bumping Along Bottom?